One of baseball’s legends has died. Yogi Berra, 90, passed away last week. He will be remembered by baseball fans as one of the greatest catchers ever to play the game. And he will be remembered by everyone else as a lovable character who often said things that were at once profound—and at the same time, ridiculous. “When you come to a fork in the road—take it,” said Berra. In other words, he likely didn’t say all of the things people have credited him with saying. But one thing is for certain, the man sure could play baseball. He appeared in 21 World Series (as a player, coach or manager), according to Wikipedia, 13 of them on the winning team. He played 19 seasons as a catcher and big hitter in baseball’s major leagues (1946 to ’63 and 1965), all but one of them for the New York Yankees. He was the manager of the New York Mets for four years. And he coached the Yankees in the 1970s. This New York Times obituary has much more information about Yogi Berra, his life and his career. Earlier this week, on Toronto’s Fan 590 radio, a sportscaster commented that Yogi Berra was one of the few baseball players to treat Jackie Robinson, the league’s first African American player, as an equal. The sportscaster then went on to say, that this may have been because Yogi had been a part of the US Navy in World War II. How might Yogi’s experiences in the US Navy affected the way he treated others? 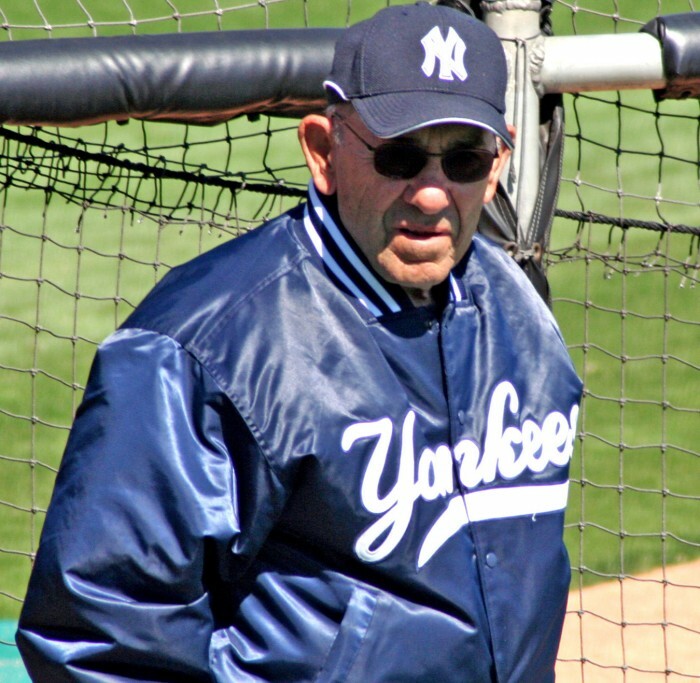 Today’s article contains many of Yogi Berra’s most famous quotes. How do these quotes help you understand who Yogi Berra was and what he may have been like? How do they add to the author’s tribute? A mistake is already wrong (a negative), so stating that the mistakes were wrong is unnecessary. At the same time, Yogi’s line could also be understood another way. Perhaps what he meant was that some mistakes are better than others. As usual, despite their humour, Yogi’s quotes have an underlying truth within them. You ain’t heard nothin’ yet, folks. Identify and explain the double negative in this sentence.